If you had asked me what the school’s or district’s goals were when I was a teacher nine years ago, I would not have been able to tell you with confidence. At the time, a typical teacher goal would state something about “increasing parent communication” or “providing differentiated opportunities for learning.” These are certainly important aspects to teaching, but don’t really provide the guidance and structure needed for teachers to affect the growth possible within their work with students. When I became an administrator eight years ago, I began to think more and more about the importance of aligning our practice so that what we were working toward was clear and understood by all. It just made sense to me that if everyone was on the same page, then the goals that were set and revisited throughout the year would become a relevant part of the work we were doing. This is not, however, always an easy process. When we began this process, it required a significant amount of dedication to ensure that our focus was directed where it needed to be. Our decisions needed to be driven by data. It wasn’t what we “thought” but rather what we “knew” based upon the data available. We needed to be “tight” by making sure the goals that were written to support the needs of our school were Strategic and Specific, Measurable, Attainable, Results-oriented, and Time-bound. The former was a process that was enlightening for all members of our team leader group and allowed members of this group to become quite adept at analyzing data. The latter proved to be a time-consuming process which needed to be revisited often to ensure that the intent of our work was not lost. The assistant principal, Donna Johnson, and I worked collaboratively with this group of dedicated team leaders to examine the most recent data we had available. We looked for and identified common areas of weakness school-wide, and determined what the greatest areas of need were for cohorts of students. This typically required the group to form consensus based upon multiple data points. Each year, the data has proven to be fairly straightforward, and it has typically been quite evident which students are not making the progress we would expect, resulting in a fairly quick determination of where our focus as a school needs to be. On many occasions, a team would turn a goal in with a certain “part” missing. Most often, the “Measureable” part of their goal was not evident. I spent a good deal of time assisting teams in making their goals measurable so that over time, teachers have developed a better understanding of what each component consists of. We are fortunate that at this point, most teachers have a very clear understanding of what it takes to formulate a goal which encompasses all necessary components. Understanding what was actually attainable was difficult, as well. For example, if we knew that 57% of our students were meeting their growth targets in reading, how could we know what an attainable percentage increase would be over a given year if it was our first year tracking this? Because we have multiple years of growth data now, we are able to fairly accurately predict a challenging, yet attainable goal. 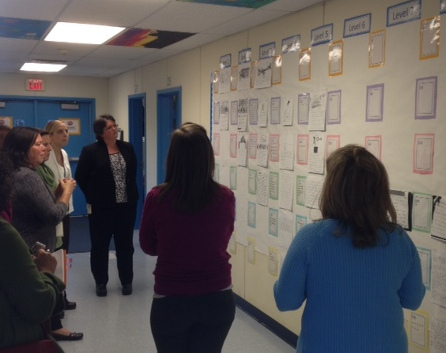 It has been very helpful to assess our SMART goals throughout the year. 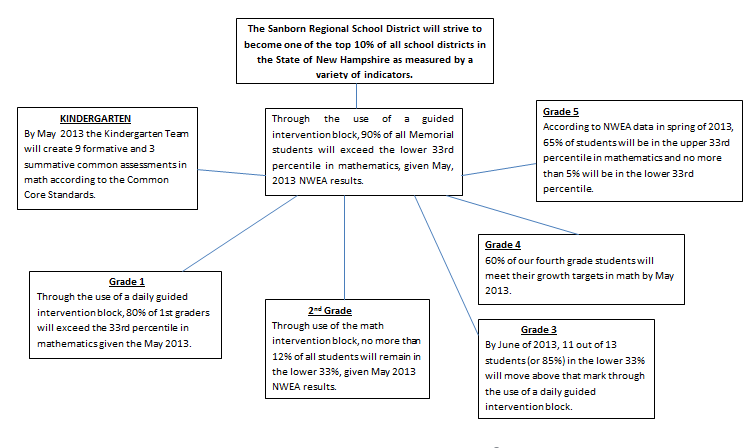 Our SMART goals are assessed mid-year and at the end of the year. Teams are responsible for analyzing and reporting out to me their growth based upon data. During the mid-year check, teams report out which goal(s) they are on track to meet or not meet and how they are going to address any areas of deficiency. During the end-of-year reporting, teachers identify what they feel helped them to achieve each goal and what instruction may have been missing that didn’t allow students to effectively progress. We have found that once these areas have been identified, teachers are cognizant of student’s individual needs and adjust instruction as appropriate to provide the support and intervention necessary for their growth. As time has passed, we have relied on our SMART goals more and more. Teams have demonstrated a clear understanding of why we use them, how they relate to their daily instruction, and how they support and, in many ways, define the work within their PLCs. I report our progress on these goals to our parents, community and Board throughout the year. There have certainly been times in which we have not met goals, and this is honestly and accurately shared. I believe this transparency is crucial to model, as well. We believe strongly that what we are doing is best for our kids and our school, and this willingness to communicate allows parents to be aware of the progress or lack of progress we have made as a school. As we near the end of the school year, our teams have been in the process of evaluating the growth of students in relation to the goals that were set back in the fall. The initial results have been very positive. It is indicative of a competent, collaborative hard-working team of teachers focusing their efforts on a common goal that is understood by all. The end result, and most important outcome, is that all students are more likely to realize success and meet their full potential.